Successfully Added Android 4K TV Box - 3D Movie Support, Android 6.0 OS, Amlogic S905X CPU, Penta-Core GPU, Miracast, Airplay, Google Play, Kodi TV to your Shopping Cart. Stunning! – the only word capable of describing the performance of this CooWell TV box that supports both 3D movies as well as 4K resolution. Holding an extremely powerful Amlogic S905 CPU this Android TV box is capable of decoding the latest H.265 codecs format and VP9 format alike – allowing you to take the absolute most out of your 4K experience. Turn your living room into your private cinema and enjoy all the latest movies, games, and more from the comfort of your own sofa. With the CooWell TV Box, you will bring a limitless amount of entertainment into your household. Featuring an Android 6.0 Operating System this TV box provides you with a stunningly smooth user experience. Its powerful CPU that has been clocked at 2.0GHz is backed up by a Penta-Core Mali-450 GPU, and 2GB of RAM. 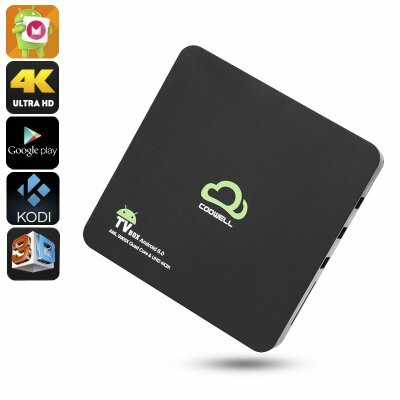 Representing all this powerful hardware you can be guaranteed that this CooWell Android TV Box lets you enjoy the latest and most demanding media without dropping a single frame. Google Play and Kodi TV support provides you with free access to millions of the latest Apps, games, movies, and more. Thanks to its Airplay feature Apple users will now be able to synchronize their devices with this Android TV box in the same manner as if they were using Apple TV – making this TV Box the perfect little Smart Home accessory for Apple and Android users alike. With an ultra-fast Wi-Fi connection and Miracast features this little electronic accessory further enhances your user experience by allowing you to enjoy the latest media in a smooth and efficient manner. Turn your regular TV into a smart-TV and enter an entirely new world of 3D games and movies. Thanks to its 3D support and 4K resolution this Android 6.0 TV Box allows you to discover new virtual worlds in mesmerizing quality. Holding up to 16GB of ROM and an additional 32GB of external data this little power-horse is capable of saving countless of the latest games, movies, and media alike without you ever having to fear about running out of storage space. Perfect for any modern household – this Android 6.0 TV Box is guaranteed to spice up your environment and bring along countless hours of joy and entertainment. It's very good product and I am happy with it!